Transcargo Limited is a licenced haulage company specialising in truckload transportation. Although its head-office is in Dar es Salaam, Transcargo operates throughout Tanzania as well as neighbouring countries Zambia, Malawi, DRC, Rwanda, Burundi, Kenya and Uganda. Having been in the industry for 25 years, the company prides itself on its dependable approach and the outstanding service it delivers to its customers. And, with distinguished names like DHL, MOGAS, Puma Energy and Total to take care of, Transcargo needed a way to protect assets in transit and report on incidents. Having heard about MiX Telematics from Scania Tanzania (another one of MiX's customers), Transcargo began enquiring about acquiring a telematics system. They were immediately impressed by what MiX could offer – as well as the after-sales support and training – and opted for MiX Fleet Manager Premium. MiX Fleet Manager Premium is a complete fleet management solution, which begins with the installation of on-board computers. These computers collect valuable vehicle and driver data, which is transmitted and made available in various formats via MiX's online information and tracking portal. Transcargo had their entire fleet kitted out and, as a result, almost immediately started to feel the effects of being able to track and monitor their assets and drivers in real-time. They also found the system valuable when an incident occurred, as historical data could be pulled up from around the time of the incident for analysis purposes. By making use of the live and historical tracking features offered by MiX Fleet Manager Premium, Transcargo was quickly able to identify areas for improvement. They took to focussing on the proactive management of their vehicles and drivers, which naturally resulted in improved driving behaviour and safety. 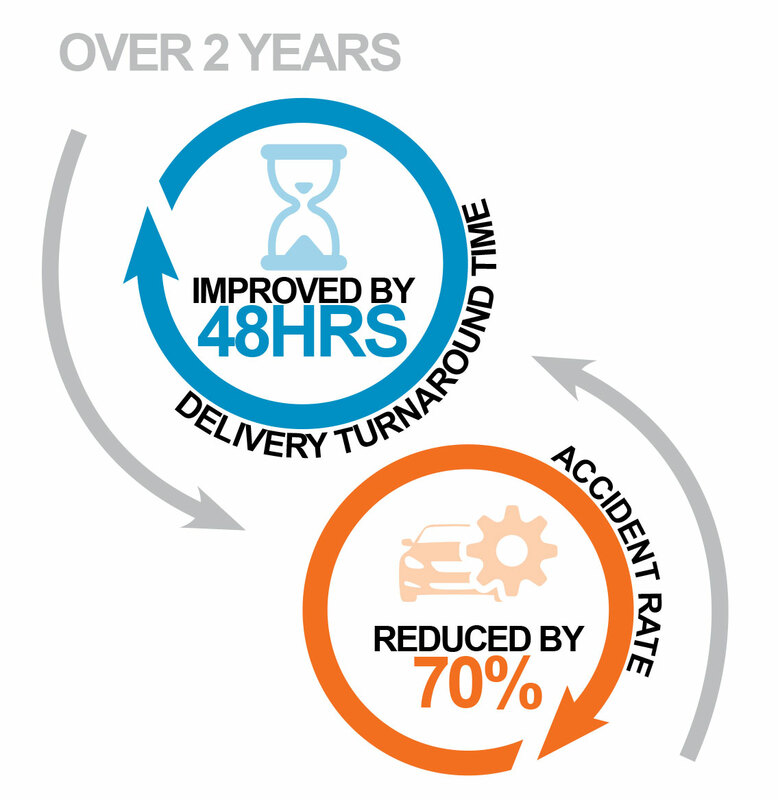 Most notably in this regard, Transcargo has managed to reduce their accident rate by 70% in only two short years. In the same amount of time, they have also improved the turnaround (delivery) time to their customers by two full days, and are now also able keep their customers updated in a more professional and accurate way. There has also been positive effect on the HSE compliance side of the business. "The system really helps me with my HSE controls," says Makorere Elisha, Transcargo's HSE Officer. "Having accurate data to rely on makes my job much easier." Because Transcargo works off an Electronic Resource Planning (ERP) system, they require their system to be integrated with MiX's solution. This will involve the purchasing of personalised maps, which is on the cards for the future to allow for automated asset location updates. They are also considering add-ons like MiX Vision, the RIBAS Display and the adoption of wireless tracking units for their trailers and other stand-alone assets. For the meantime, however, all new vehicles are immediately fitted with an on-board computer and added to Transcargo's growing network.